Java Bay will put you in the mood for meditation and introspection. It’s a place where you can connect with the sea, the sky, and the locals. Located just minutes from the beach, you can spend your mornings sunbathing or enjoying water sports like snorkeling and scuba diving. Meals can be enjoyed on the pool deck, and you can end your day watching the sun set over the water. Java Bay is a 5,000 sq. ft. Balinese villa designed by London architect, Harper Downie. It is situated on nearly one acre within Calijanda, a gated community adjoining Royal Westmoreland and Sugar Hill. Secure, electric gates lead to Java Bay’s private drive and elegant architecture. The 15 meter infinity pool and lounging gazebo is hidden from neighbors by lush, leafy palms. A wide awning wraps the length of the house and shades plush seating and bar top dining for 6. The Royal Westmoreland’s 18-hole championship golf course, tennis courts, and spa are all nearby for further entertainment. The villa has an open plan layout and is furnished in an meditative Indonesian style, which is complimented by Portuguese limestone, granite, and handmade Balinese carvings. Java Bay is arranged over two stories, and its ground floor incorporates the limestone entrance hall, large formal dining hall, media area, sitting room, kitchen, and utility room. Watch movies or read a novel from the library in the media room, which has an entertainment system, a U-shaped sectional, and a full bookshelf. The kitchen is fully outfitted with stainless steel appliances, a breakfast bar, and a coffeemaker; the adjacent living room has cushioned rattan furnishings and dining for 10. All five bedrooms are air-conditioned with four having ensuite bathrooms. The master suite has a king bed and a sunlit spa courtyard that’s furnished with an outdoor soaking tub, an outdoor shower, small palm fronds, and lounging space. The second king suite also has a private courtyard, with an outdoor soaking tub, shower, and a daybed. This bedroom can also be made up with two twin beds for children. The third suite on this level has a twin bed. Upstairs, there are two double suites with bathtubs. 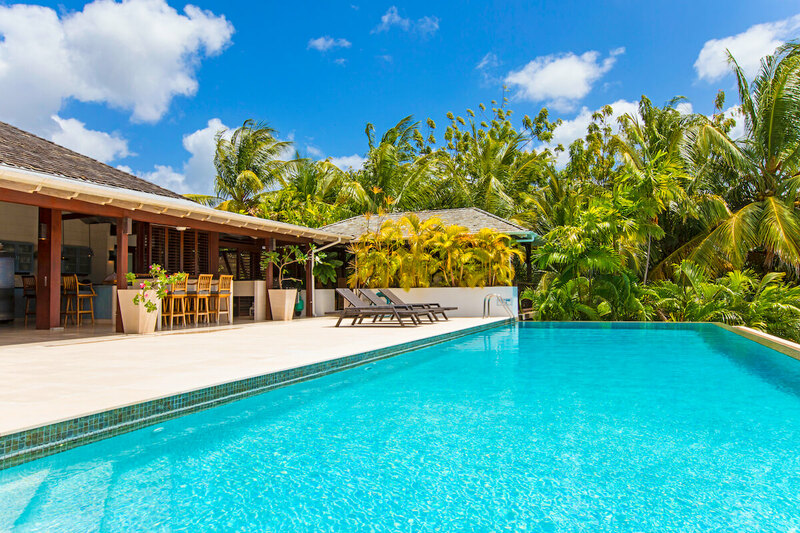 Java Bay is within a 5 minute drive of Holetown’s restaurants, shops, and beaches. Guests have access to Royal Westmoreland’s Clubhouse, Kid’s Club, and Rum Shop. Upon arrival at the airport guests will secure a rental vehicle and drive to the villa using the directions provided. Housekeeping between the hours of 8AM - 3PM.